Stony Brook Medicine has opened a new, fully equipped Cardiac Catheterization (Cath) Laboratory at Stony Brook Southampton Hospital, to provide emergency and elective treatments delivered by Stony Brook University Heart Institute specialists. By allowing easier, faster access to the highest standard of cardiac care, the new lab provides more immediate, potentially lifesaving diagnosis and treatment for residents of the East End of Long Island. The standard of care for a person experiencing a heart attack is that the blocked artery should be opened within 90 minutes of contact with medical care. That procedure can only be done in a cardiac catheterization lab by highly trained personnel. For the rapidly increasing population of the East End, the nearest cath lab previously was located at Stony Brook University Hospital, up to 70 miles and a 60- to 90-minute drive. Even transportation by ambulance or helicopter could result in a life-threatening delay. 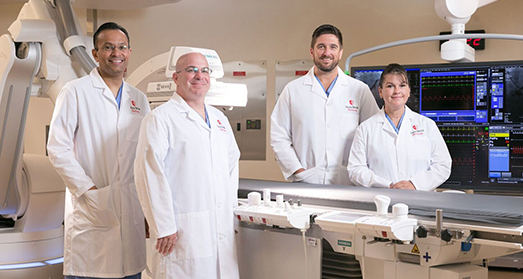 Now, this new Cath Lab, staffed by cardiac specialists from Stony Brook University Heart Institute, provides clinically complex care to critically ill heart patients on the East End. The lab will save lives by providing more immediate intervention for serious heart events such as myocardial infarctions (heart attacks). A delay in restoring blood flow through an artery increases the likelihood for significant damage to the heart. By allowing physicians to open a blocked artery in Southampton, without having to first transport a patient to Stony Brook, damage to the heart can be minimized and total heart failure may be prevented. "The new Cardiac Program is the most dramatic example of exactly the sort of collaboration we hoped would happen when Southampton Hospital joined Stony Brook Medicine, as we bring the region's top medical services closer to where people live,” said Robert Chaloner, Chief Administrative Officer, Stony Brook Southampton Hospital. “This truly signals the beginning of a new era of healthcare for our East End communities." Cardiac catheterization: used to provide detailed assessment of the heart’s performance, including its valves and the coronary arteries, and to locate blockages or narrowing of the arteries. Angioplasty: a procedure that involves inserting a balloon-tipped catheter to clear blocked arteries. Stenting: a procedure in which the physician implants an expandable metal coil in a narrowed artery to keep it open. Intravascular ultrasound: uses high-frequency sound waves to create images of the inside structure and walls of the arteries, to help the physician determine extent of disease. Impella®: a treatment for heart failure that implants a tiny device in the left ventricle of the heart to improve blood flow and stabilize the patient for transfer for further treatment. A fluoroscopy arm, which is a mobile x-ray arm, allows physicians to visualize the coronary arteries during the procedure. Advanced, highly specialized computer capabilities measure pressure inside the chambers of the heart or lungs, allowing physicians to make diagnostic and treatment assessments. When necessary, patients in need of further treatment or surgery can be transferred to Stony Brook University Hospital. “Faster access to the highest standard of cardiac care means more immediate, lifesaving diagnosis and treatment for residents of the East End of Long Island,” said Travis Bench, MD, Director, Cardiac Catheterization Lab, Stony Brook Southampton Hospital. The Southampton lab will be staffed every day, around the clock, by Stony Brook Heart Institute’s interventional cardiologists with the most up-to-date knowledge and skills to diagnose and treat patients with heart disease. Lab director and interventional cardiologist Travis Bench, MD, and Dhaval Patel, MD, cardiologist, have Stony Brook Cardiology practices in Center Moriches and Southampton. Critical care nurses and technicians assist during PCI procedures, and provide care in a new cardiac unit that is being created at Southampton Hospital. Interventional radiology nurses provide care and conscious sedation during procedures. Nurse practitioners (NPs) and physician assistants (PAs) assist patients wherever needed. Stony Brook Southampton Hospital is centered between the North and South Forks in Suffolk County. Parking is extensive, with valet service for patients who cannot or prefer not to park the car themselves.